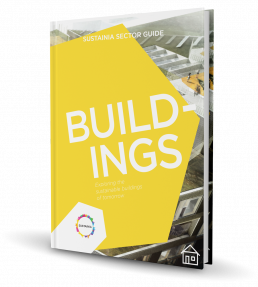 Sustainia published an educational guide for the buildings sector, to stimulate interest for projects focused on sustainable retrofits and green building construction. Buildings are large contributors of solid waste and greenhouse gas emissions, but in 2012, conversations about green buildings and sustainability were just beginning. There was a real need to raise awareness about the risks and opportunities, to highlight what is possible, and understand what can be gained from the buildings sector. In collaboration with VELUX, Realdania, Ørsted, (formerly DONG Energy), and Copenhagen Municipality, Sustainia created a guide to the buildings sector, based on the latest available research and compelling case stories. We highlighted the socio-economic benefits of building sustainably, potential for local job creation, and certification and policy tools that can be used as drivers for positive change. This publication targeted investors, planners, and policy makers, to show not only what can be done but why it’s important to make buildings more sustainable. The sector guide can be downloaded here. We worked with a consortium of public and private organisations on this publication: VELUX, Ørsted, Realdania, and Copenhagen Municipality.